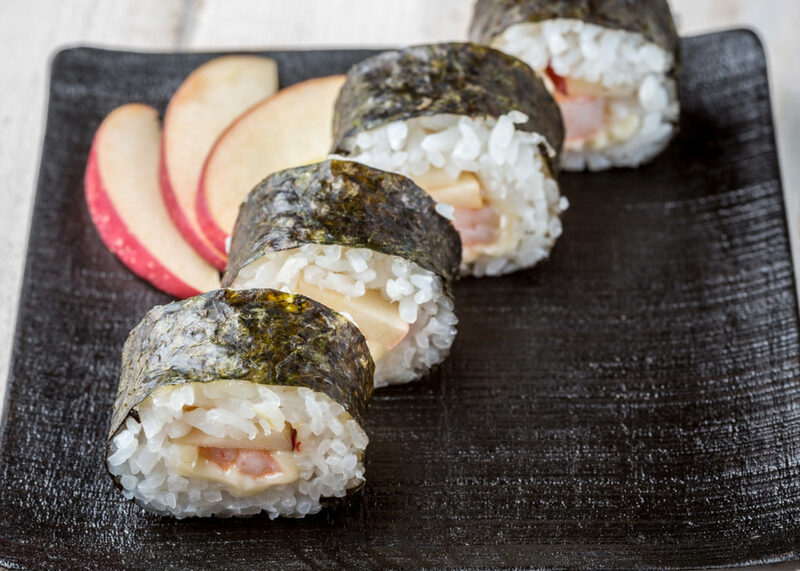 Several people have told us that we should try making sushi using apples and shrimp, so finally we have! I know everyone always says to use Fuji apples for their sweetness… but I didn’t have any so I just made do with what I had! These apples were sweet too though, so I figure it’s fine! 🙂 The cheese definitely helped, as it was sweet but a little bland without the saltiness and spice of the cheese. So this is random… but I am completely and totally addicted to So You Think You Can Dance. I get so emotionally attached to the dancers… I’m always mad when a dancer I really liked gets voted off! (Like when Jessi was voted off by the judges because she had been sick the day before, or when Hok got voted off last week!) Yes yes, I am a dork, I know. 😛 I suppose part of the reason is because I was a dancer for most of my life, and only recently stopped dancing so I still fantasize about being on that show, working with all of those amazing choreographers! Wouldn’t that be a dream come true! Haha not a chance of that, but I can dream, right? Oh, and I’ll give you a hint about one of the new projects that Son and I are working on… it has to do with dance! The blog related to the project will be up soon, so I’ll have a link to it if anyone is interested in reading it. Also, I was recently looking at Karianne’s web site (if you haven’t seen it, you should check it out! ), and saw a post about a Sushi Competition! Hehe it sounds like a lot of fun… if any of you are in London or are lucky enough to be able to go, please please PLEASE let me know how it goes! (I have school 😛 and I can’t exactly get to London anyways!) I would love to hear about all the awesome sushi creations that they have there! Core the apples, cut each apple into 9 slices. Cut each slice of cheese into thirds. 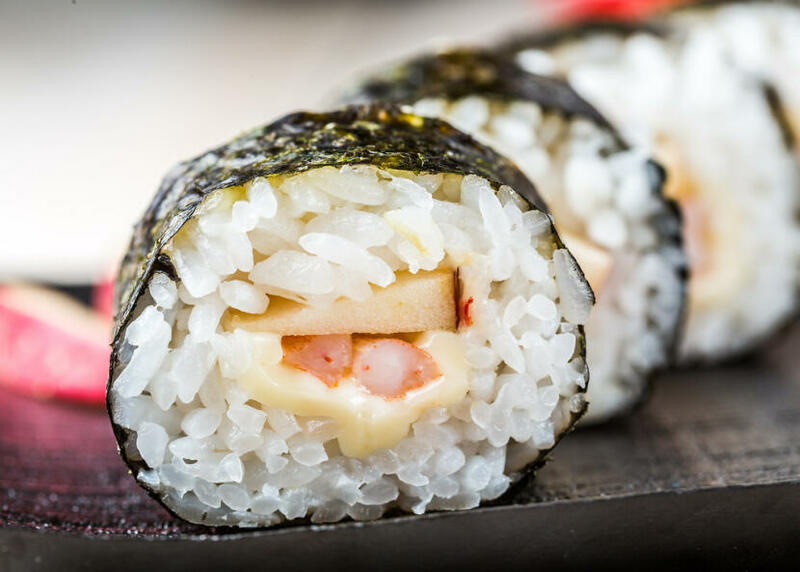 Roll the sushi, using 3 slices of apple, one slice worth of cheese, and 1/4 cup mini shrimp as your fillings. I love that two out of three winners last year were women! Karianne – 😀 I only do it for blogs I love! Yeah I saw them… they are really awesome! I don’t know that I’m quite up to that level… but I’m so flattered that you think I am! I don’t know about entering though… on the website it says all recipes become property of them and I don’t know if I would be comfortable with that. :/ Oh well… I’ll definitely be keeping watch for the announcement of the winners though! Yvo – Yeah… I’m pretty sure you mentioned it in a comment a while back, and one of my uncles had also mentioned something like this a while ago. The cheese definitely added the kick that the sushi needed… yum! Yeah… if you go to the entry form, it says that all recipes become their property. I’m still considering it though… but I have no idea what I would want to enter! Hehe I’m definitely going to check out the other competition too! Thanks about the navigation! That was all Son… isn’t he amazing? 😀 No, I haven’t given a link to the dance blog yet… it should be up within a week so when it is up and I start posting, I’ll definitely have a link for you! omg, I love this! I’m so glad i found this blog. You just got a new reader! 🙂 love it!!! !